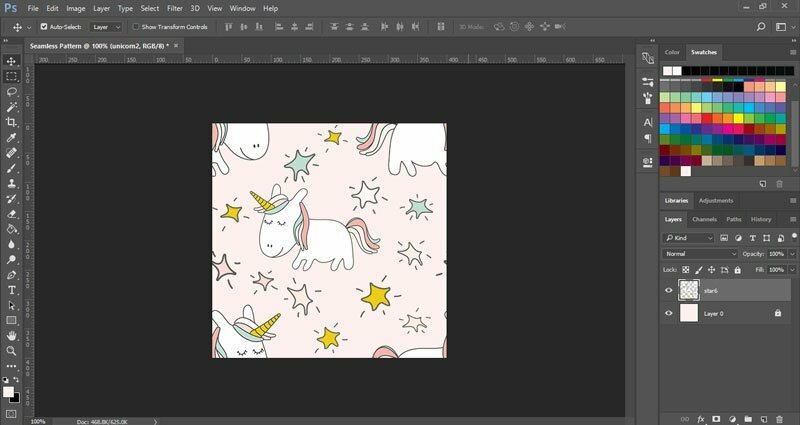 Follow this tutorial to learn a quick and easy way to turn your graphics into a seamless pattern in Photoshop. I’m going to use hand-drawn illustrations from my Magical Unicorns collection, but you can use clip-art, drawings, watercolor illustrations, or even Photoshop brushes. 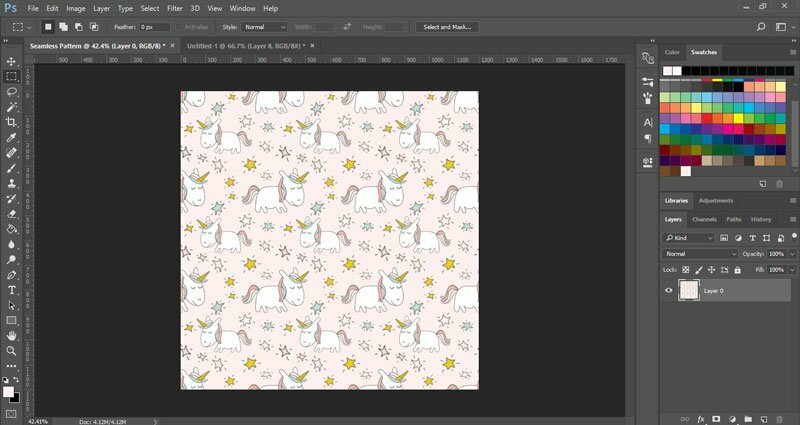 I usually use Illustrator to create seamless patterns. Photoshop is just as easy to use, but the vector patterns you can make in Illustrator are easy to scale and recolor. You can also edit them after you save the pattern. This is something you can’t do in Photoshop and that’s why I recommend using Illustrator. I do use Photoshop to create seamless texture and I think it works great for watercolor and hand-drawn graphics. First, open Photoshop and create a new document. My canvas is 400x400px at 72 pixels/inch. If you want to print the image, use a higher resolution and the CMYK color mode. 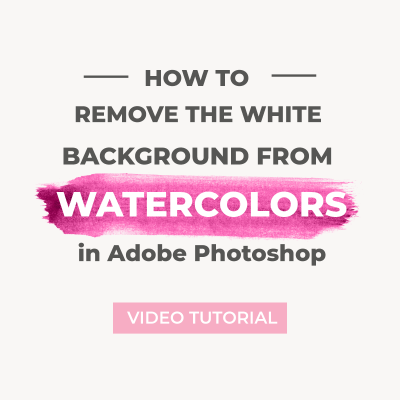 Use the fill tool to recolor your background and then lock the layer by clicking on the padlock icon in the Layers panel. 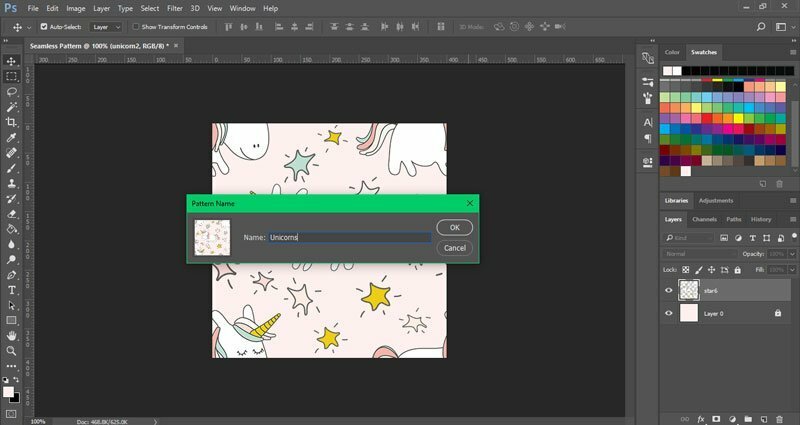 Drag the illustrations you want to use in the center of the canvas. Use the bounding box to resize your image. You can also rotate it. Press Enter to save the changes. Add the other graphics and try to fill the canvas. 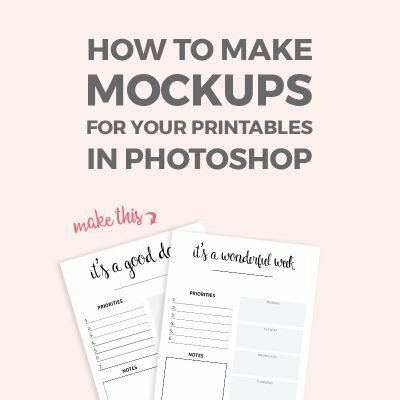 Make sure the images are inside the workspace. When you are happy with the design, go to the Layers panel, select all the layers, right-click on them and choose Merge from the menu. You should now have a background layer and a single layer with all the graphics. We are going to use the Offset filter to make the repeating pattern. Select the top layer and go to Filter > Other > Offset. 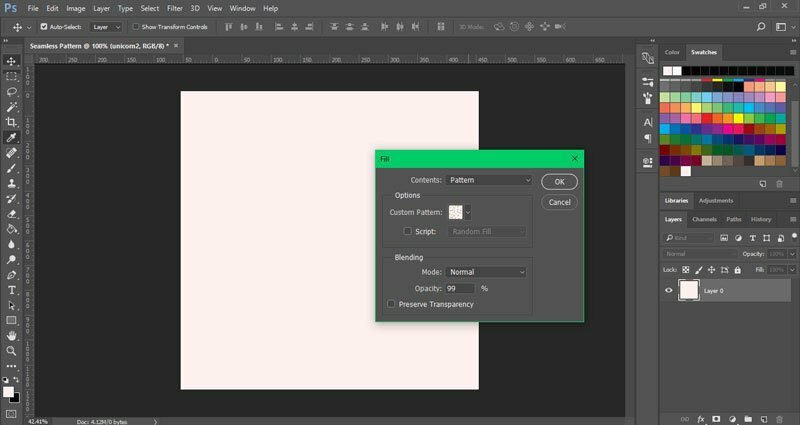 Make sure Wrap Around is selected, and enter half the width of your canvas for the horizontal value, and half the height of your canvas for the vertical value. You can use other graphics to fill the empty areas that are now in the middle. When the pattern is done, go to the Layers panel and merge all the layers. To save the pattern, go to Edit > Define Pattern and give your pattern a new name. To test your pattern, open a new document and create a canvas that’s larger than your pattern tile. Go to Edit > Fill, set the Contents to Pattern and select the new pattern from the Custom Pattern list. Press OK to use it. You can also use the seamless patterns with the Fill Tool or with the Shape Tools. 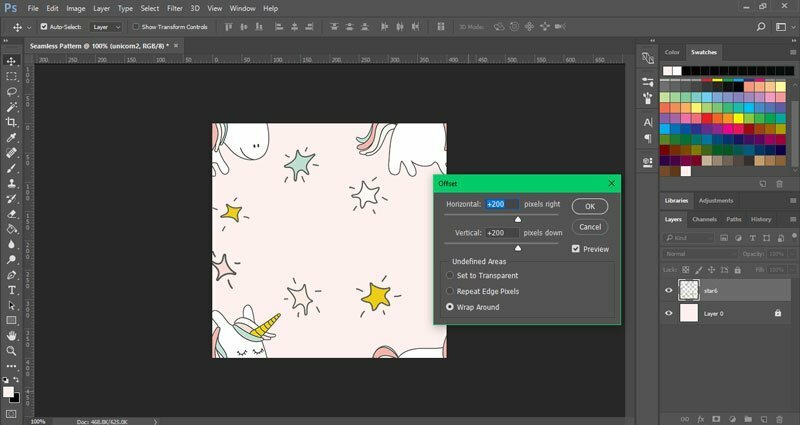 Do you create and use seamless patterns in Photoshop? Glad you like it, Eliza! Your watercolor florals are lovely. I’m sure they will look great on fabrics. 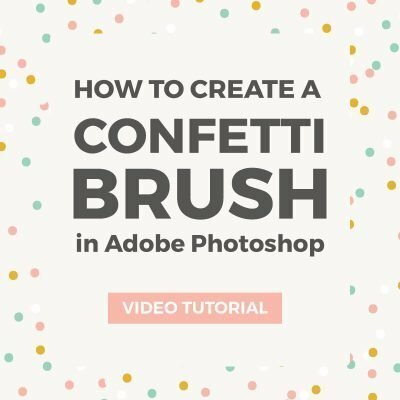 This is so clear and easy to follow – thank you so much for such a wonderful tutorial! Can’t wait to give it a go now. I love your unicorn designs too, by the way. Deliciously cute! Thanks for sharing this seamless pattern. I watched you on YouTube also. 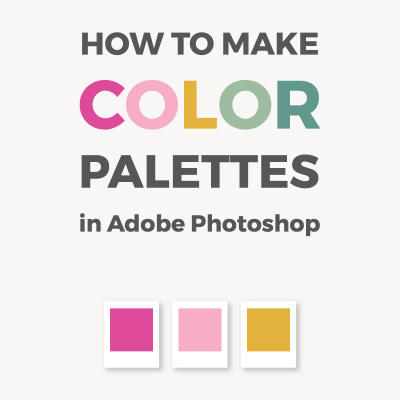 Great tutorial, I love it because I am familiar with Photoshop and not Illustrator. 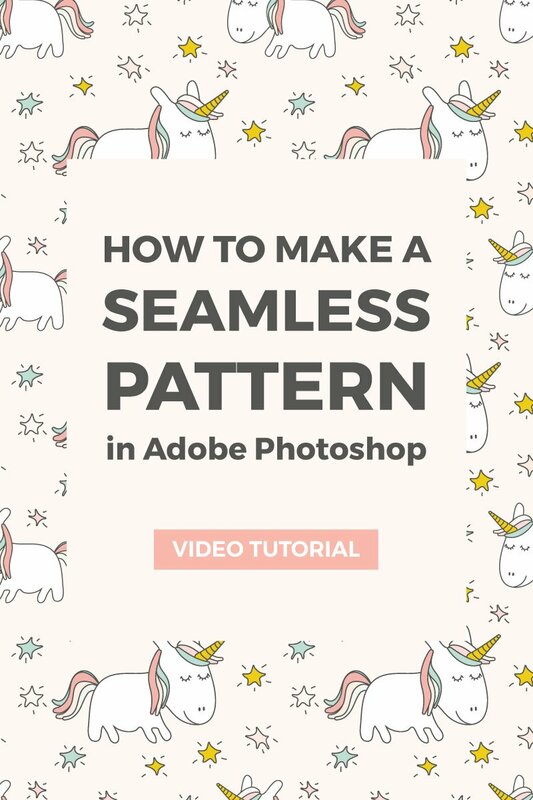 How would you save the seamless pattern to print on fabric from Photoshop? Thank you !